UNITED NATIONS, Aug 17 2017 (IPS) - The UN’s refugee agency is relocating more than 33,000 Congolese refugees from overcrowded temporary shelters in northern Angola to a more permanent establishment in Lóvua. 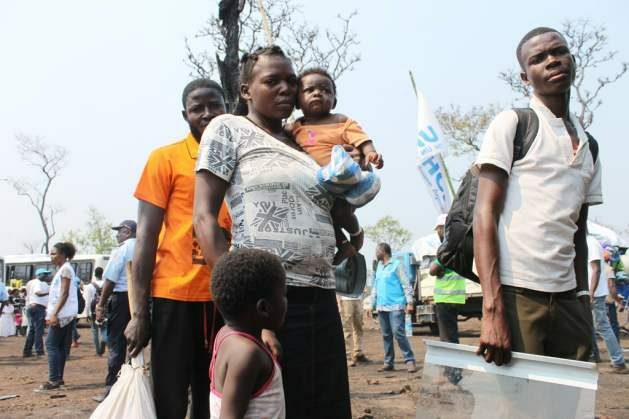 From April this year, Angola witnessed an influx of refugees—who were fleeing violence in neighbouring Democratic Republic of Congo—to its Lunda Norte province. The government rushed to manage the situation by setting up temporary centers in Cacanda and Mussunge. From the very beginning, authorities in Angola deliberated on questions of a more permanent settlement to ensure stability within the country. “The centers quickly became overcrowded and the situation became very difficult. The government began working on setting up Lóvua two months ago,” Margarida Loureiro, who works as an external relations officer at the UN Field Office in Dundo, the provincial capital of Lunda Norte, told IPS. Not all refugees who have biometrically registered—and all 33,142 have—chose to live in the temporary centers. Many lived with other host communities across Lunda Norte. Unintentionally, this allowed the government to relocate, for instance, roughly 400 families from Mussunge, and close the shelter quickly. Now, the UN refugee agency and government authorities, through town hall meetings, have brought attention to a more cohesive space for all Congolese refugees in Lóvua. Lóvua, which is located 100 kms (or 62 miles) from the DRC border, has been bracketed into nine zones. Every zone is divided by nine villages and every village is divided by 72 plots of land. Each village can host a maximum of 360 people. When families first arrive at the shelter, they are assisted with food and blankets. After a 24-hour period of assistance, they are sent to their plot of land where they work to build their own homes. Still, funding the project, in spite of an interagency appeal by the UN in June for 65.5 million dollars, has had dismal results—only 32 percent of the money has come through. Agencies are predicting that an estimated 50,000 Congolese refugees will need help by the end of the year. “Although the number of refugee arrivals have swindled at this time of the year, the government has kept its borders open. To ensure Lóvua’s sustainability, we still need greater funding,” said Margarida. Angola is a signatory to the 1951 Convention Relating to the Status of Refugees, and has historically received refugees from the DRC. Before the influx in April, Angola hosted as many as 13,400 refugees from DRC.